Bleary eyed, we got out of our tents and before too long were on our way, on foot, walking into the Quebrada. Rudolf and Attila had been here before and were keen to explore further. The cacti that were growing at the mouth of the valley had been tentatively identified as Copiapoa varispinata but later, on our return to England and after a visit by Rudolf and myself to the Herbarium at Utrecht (Netherlands) where Ritter’s original type material for this taxon had been deposited, we realised that this was not the correct name. So, for the time being it became Copiapoa sp. Botija #1 (mound forming). As we progressed up the valley, another Copiapoa, C. atacamensis was found, and further still (S067), Rudolf and Attila pointed out another Copiapoa – long stems, hanging from the rock face. This was at this time referred to as Copiapoa sp. Botija #2 and has since been described by Graham Charles and Nigel Taylor as Copiapoa decorticans (in Cactaceae Systematics Initiatives 13:15, 2002). Although this plant has been known at least since 1990, it had never been formally described. We walked on, until the Valley, that had run east so far, seemed to form a T junction with a high dark hill, covered in large, healthy looking clumps of Copiapoa (Subgenus Pilocopiapoa) solaris (S068). It was remarkable that where as C. solaris grew on the dark soil, C. atacamensis was only found on the lighter coloured rocks. I’m not sure if this observation is significant, but it was certainly striking. 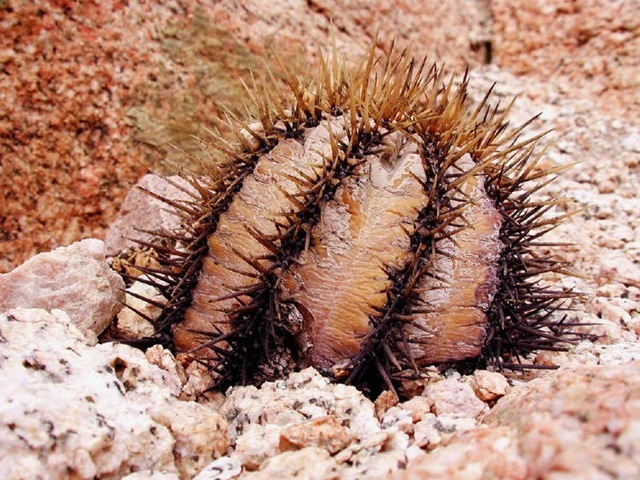 Copiapoa are not generally known to have particular soil requirements in cultivation and we failed to collect specimens of each type of soil to take back for further analysis. This is where the party split up. Michelle and Attila stayed to collect some seed, before exploring the turning north while Rudolf lead a party south. His objective was to follow this narrowing canyon that, according to our maps, would lead to a saddle in the hills and, once crossed, would lead them into the next valley south, the Quebrada Izcuña. Marlon and I had agreed to walk back to the cars and drive one of the cars to the mouth of the Izcuña Valley, where we would pick up the walkers. On our walk back, we again found evidence the presence of mice, including a couple of dead ones in varying states of decay. This probably explained the presence of a couple of very shy foxes that we had spotted playing a game of hide and seek with us. There was just one small flaw in the otherwise wonderfully thought out plan for the day – it had not allowed for my inexperience of driving a 4 wheel drive car through talcum powder like dust, so that the car became stuck in this, a few hundred yards away from the mouth of Izcuña. There was little that the two of us could do. We made some futile attempts at digging the wheels out with our hands and tried to use the plastic cover for the back of the pick-up to try and give us some grip, but to no avail – until the walkers appeared out of the valley and Attila and Michelle turned up with their car to pull us out, so that we could return to Taltal. S067: small C. atacamensis, growing in the eastern half of Quebrada Botija.